For those asking about commissions: I'm not taking commissions, thanks for your interest. About the art... I'm playing Metal Gear Rising (finally) and I'm somehow adicted, what a great game! and I love Raiden! AHHHH!!! Raiden by Zeilyan is a portrait painting with a beautiful play of light and shadow and a cool palette that helps amplify the pensive expression. From the suggester: "So realistic and dynamic, a really awe-inspiring portrait! And to think that Raiden was once a conflicted newbie in place of Snake. Now he's a force to be reckoned with. Gosh you drew Raiden so pretty here! I mean he has always been pretty but he looks amazing in your style as well! Gorgeous work. Didn't notice the blood at first, but that just adds to the appeal. Awesome job portraying Raiden. The details are extensive, especially on his skin. The beam of red light from his right eye is an awesome feature and brings a nice contrast with his left eye. These qualities, combined with the dark palette, create an awesome, intense atmosphere. OH MY DOGE YES! 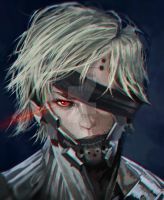 Raiden as a DD?! HELL YEAH! Oh man, one of the best hack'n'slash games I've ever played. He's right up there with Deadpool, Dante, Vergil, Bayonetta, and Korra. loved the game and raiden mmmwwwwwaaaa! Hi Master! I like your style... the lost cyberpunk! you have look my pictures mixed tecnics?? Where are you from? Many warm congratulations, my dear, you really deserve it! It's such a beautiful and expressive portrait! Wow, interesting style, really. Looks amazing! A Fun Place for ALL Fan Artists!